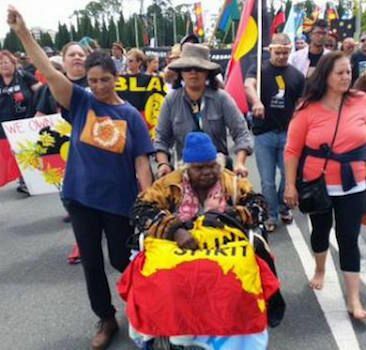 Why didn't The Canberra Times report on the Invasion Day protest in Canberra? John Passant asks why the whitewash of the Invasion Day protest in Canberra by The Canberra Times. UP TO 500 people attended the Invasion Day Protest in Garema Place in Canberra on 26 January to highlight the genocide then and now against Aboriginal people. There was not one mention, not one photo of the protest in The Canberra Times. Amid the many pages of superficiality about the celebration of Australia Day the day after, “my” newspaper saw fit to edit out this part of our history. Shame, Canberra Times, shame for blacking out this important protest and highlighting yet again the discrimination Indigenous Australia suffers. Its whitewashing will not silence the voices against celebrating genocide and their just demands for a treaty, recognition of sovereignty and paying the rent. On the other hand, The Canberra Times did run a full two pages on 27 January on the Australia Day “celebrations”. You had lots of happy photos of smiling, happy Australians, drinking, barbecuing and swimming. You even included an interview with an Australian in Lahore at a secret location drinking beer. What a brave Aussie to celebrate our national day in the traditional way in spite of such adversity! That is the true ANZAC spirit. Or is it the true Australia Day spirit? Let this reality sink in. The Canberra Times could interview someone in Lahore about Australia Day but couldn't report on 500 citizens protesting against Invasion Day in Canberra. That should tell us something about the media and in particular about The Canberra Times. By comparison, ask your selves what will The Canberra Times do when the next Reclaim White Australia rally is held in Canberra? It will report on it before, during and after the event. It won't challenge the narrative or point out the fascist potentiality or links to fascists of the protests. That might alienate the potential readership The Canberra Times leadership has identified, and undermine the ruling class project of building up the fascists for use in a time of acute economic and political crisis. The Americanisation of Australia Day – the hoopla, the parties, and the incessant message that we are all in this together – is a product of austerity. The neoliberal agenda requires an overarching unifying theme that might make us accept cuts to health, education, transport and public housing, and an increased tax burden through GST “reforms”. Invasion Day protests challenge that agenda. That is part of the reason The Canberra Times airbrushed out of history our protest against celebrating genocide. Another reason is the systemic racism of the Australian ruling class of which The Canberra Times and the rest of the Fairfax stable are an important part. Our leaders shove their message of “our” Australian superiority down our throats every day. This systemic racism includes state sanctioned and supported Islamophobia, demonising refugees, invading Aboriginal lands, condemning Aboriginal people to poverty and early deaths and policing their communities into prison. The list goes on and on. I also think there is another more self-interested reason for the Invasion Day protest being on The Canberra Times' blacklist. The paid readership of The Canberra Times appears to be in free fall. Recently it lost 20 per cent of its paid weekday readership (from 25,000 to 20,000). Clearly the editorial brains trust at The Canberra Times thinks that jingoism sells and that having lured innocent readers into the fly trap of nationalist claptrap the paper wants to keep these new, or perhaps even returning, readers. Running even one story on the protest against Invasion Day might alienate this potential readership, or so management may think. If we couple this jump to the right of the paper with its cost cutting, what we are witnessing is the degeneration of an occasional irritant in the eye of the Australian ruling class into a tabloid, dumbed down for an audience that it won't attract and won't hold. Unfortunately, there is no strong union anymore in Australian media that could impose some sense of decency and rigour into the for profit scandal sheets and their mainstream competitors. Luckily there is still social media where there are many many reports challenging the narrative of the ruling class and uncritical lackeys like The Canberra Times. John Passant is a freelance member of the Media, Entertainment and Arts Alliance. He blogs at En Passant. He is a doctoral candidate in the School of Politics and International Relations at the ANU and is a former Assistant Commissioner of Taxation. Support a fair go. Subscribe to IA from just $5.